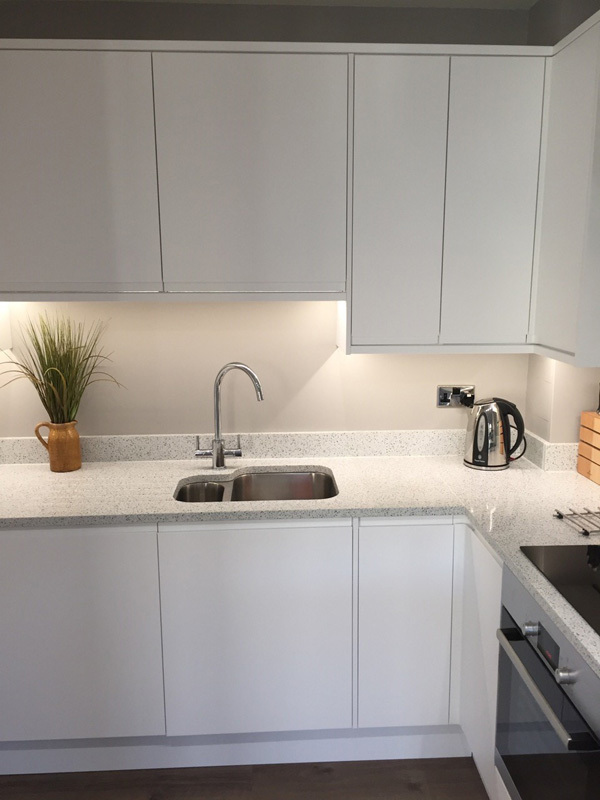 Here is a small selection of some of the home improvements and refurbishments we have recently done for customers in and around Worthing, Sussex. 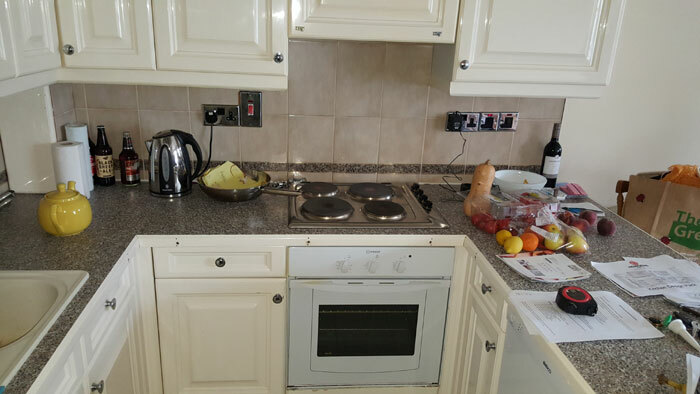 Please click on a thumbnail image below to enlarge a photo. 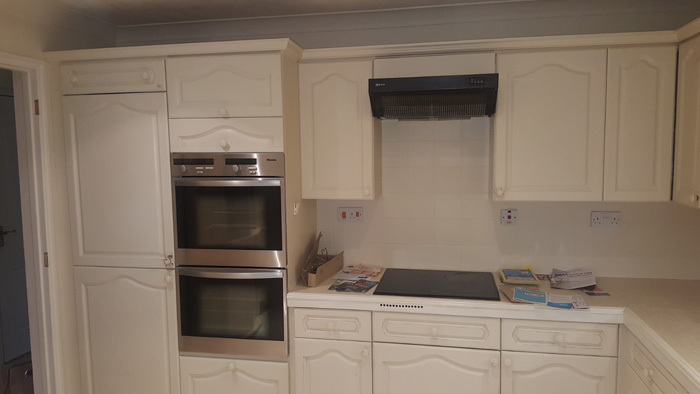 For more examples of our work and customer testimonials, please contact us. 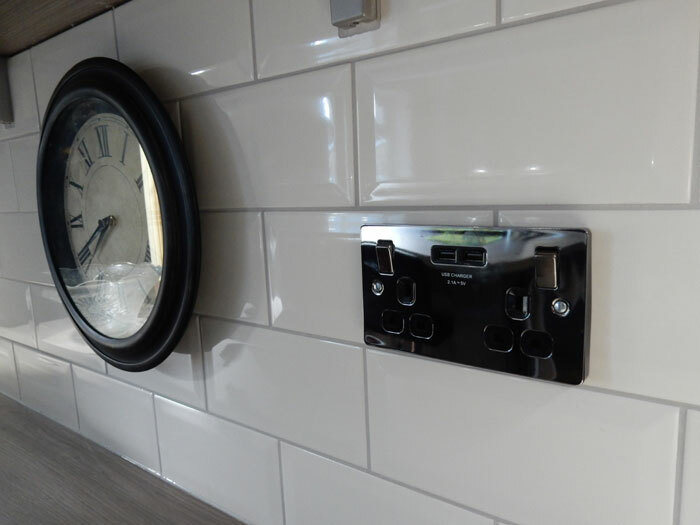 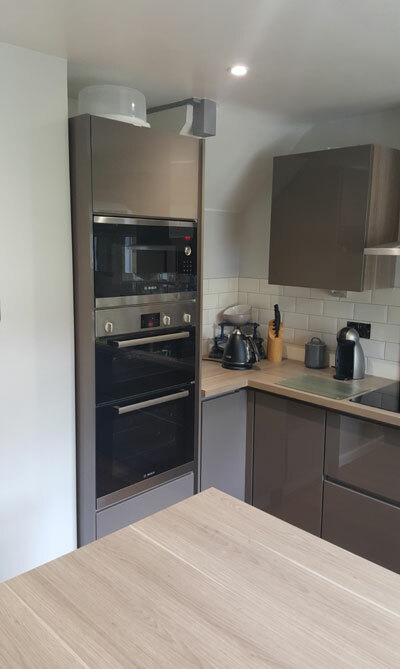 From fixing a leaking tap, installing a cooker or plumbing in a washing machine, to complete kitchen design and fitting, our kitchen fitters, electricians and plumbers guarantee your satisfaction. 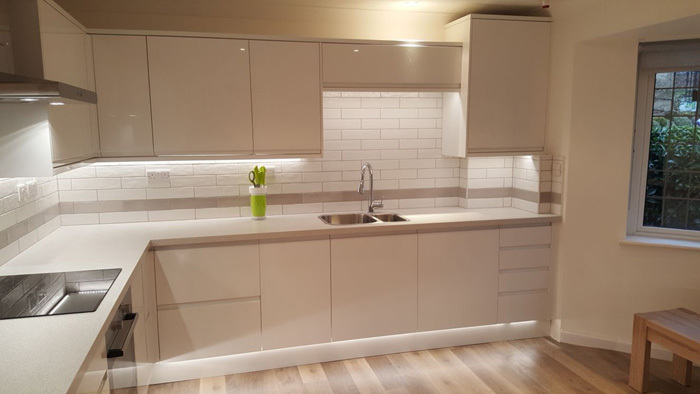 This customer recently purchased a house and wanted us to supply and fit a new handless Howdens Clerkenwell kitchen in gloss white with integrated appliance, under cabinet LED strip lights and plinth lights. 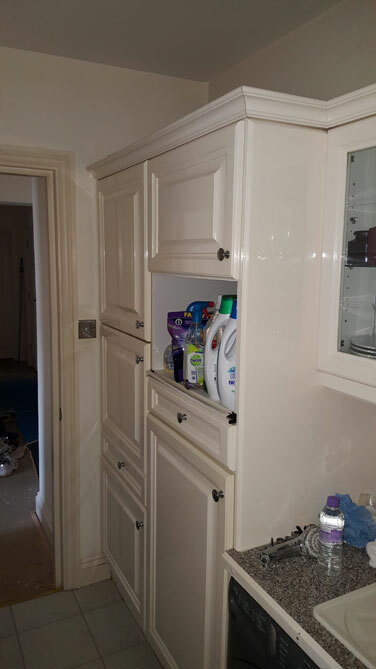 Our customer wanted to source most of the appliances herself but wanted the rest left to us. 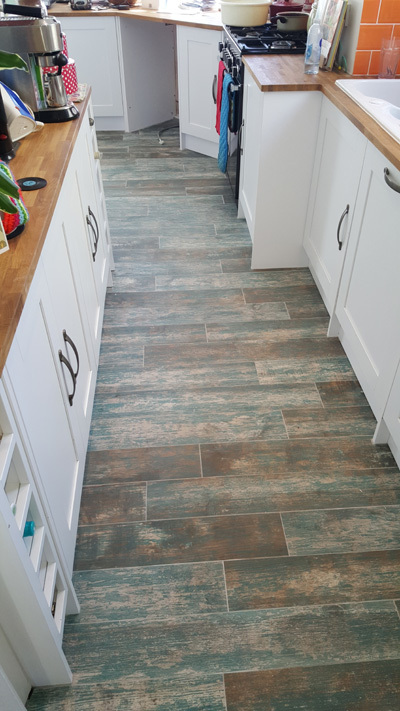 We referred Ms B to IB Flooring for the kitchen floor where she found just what she had in mind with a Karndean style floor. 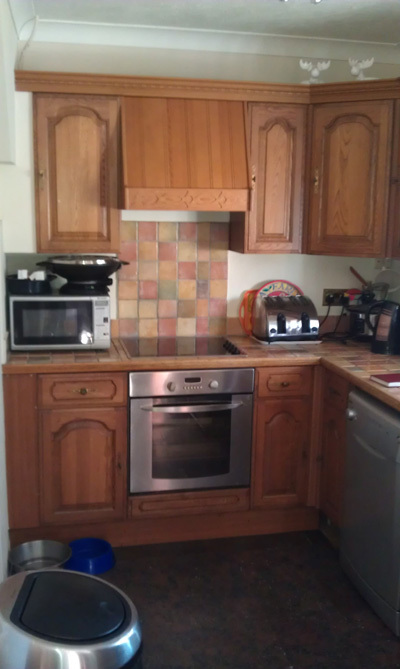 With everything sorted and agreed. 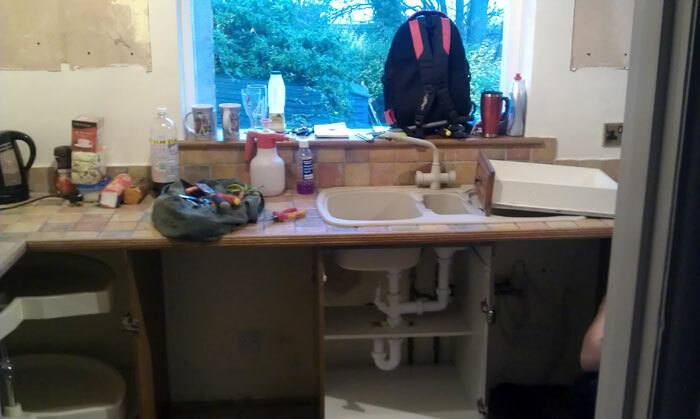 Ms B went on holiday and left the work to us. 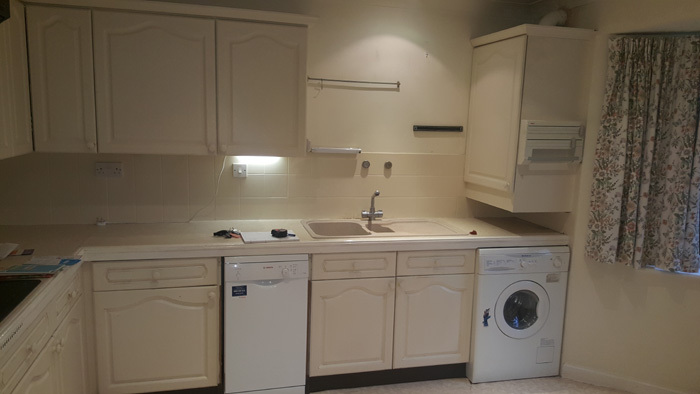 A complete fitted kitchen transormation including a change to the layout, closing off an unwanted door to accomodate a utility cupboard for the washing machine and allowing for more kitchen units. 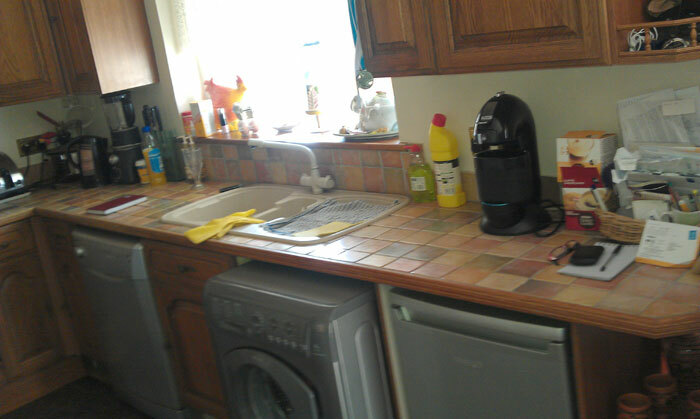 We also shortened the breakfast counter to enable easier access to the new layout. 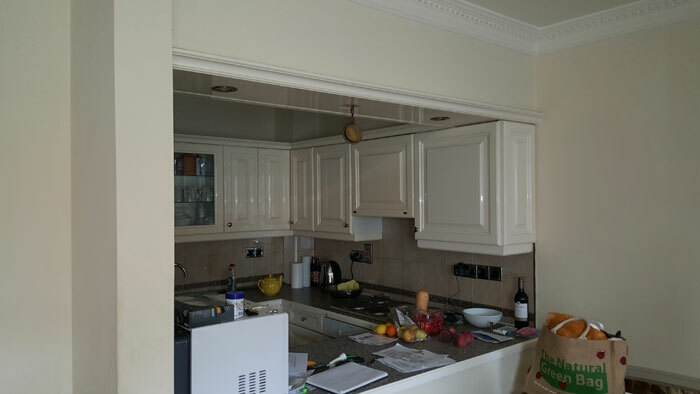 We raised the stud ceiling boxing above the breakfast bar to allow for more light to the kitchen thus creating the appearance of a larger room. 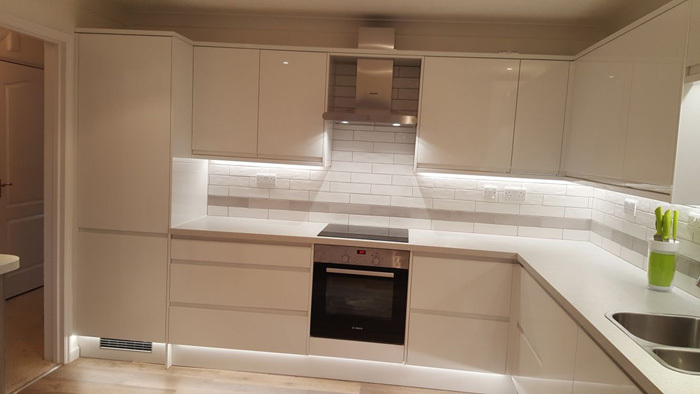 The existing 'eye-ball' ceiling lights were replaced with low-profile dimmable LED spot lights, and LED strip lights were fitted to the undersides of the new cupboard units to create excellent all round lighting and reducing shadows to aid food prep etc. 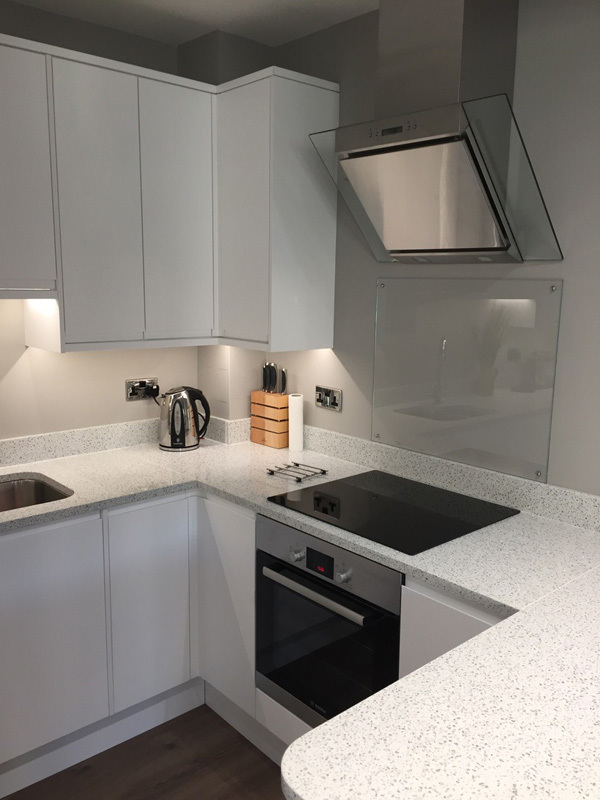 The dishwasher and fridge/freezer are both integrated, while the kitchen flows with the Clerkenwell matt white range and a white quartz worktop with quartz up-stands. 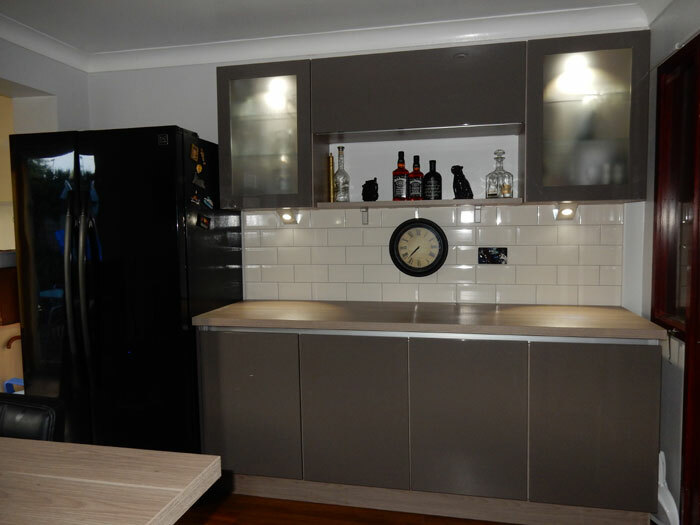 We took this through from concept to a complete kitchen makeover. 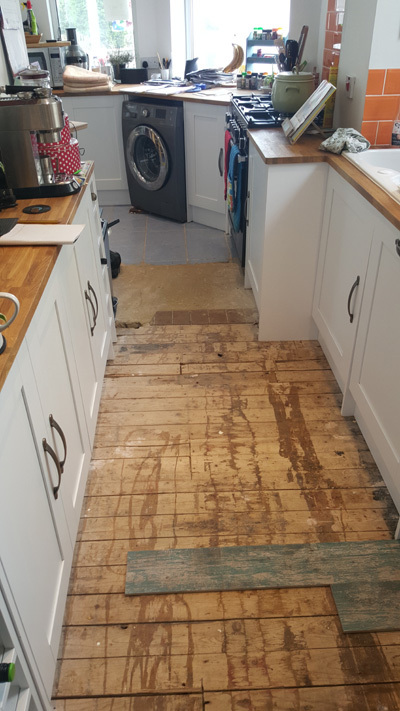 The floor had a ridge across the centre from where the kitchen / dining room wall used to be. 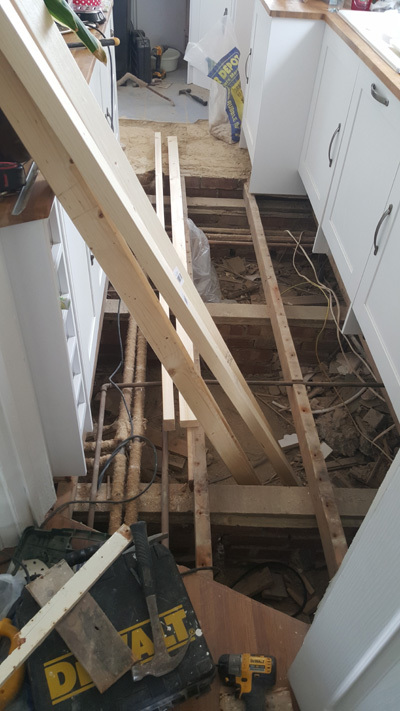 There were also a couple of floor joists that had to be replaced due to a long term leak from the washing machine. 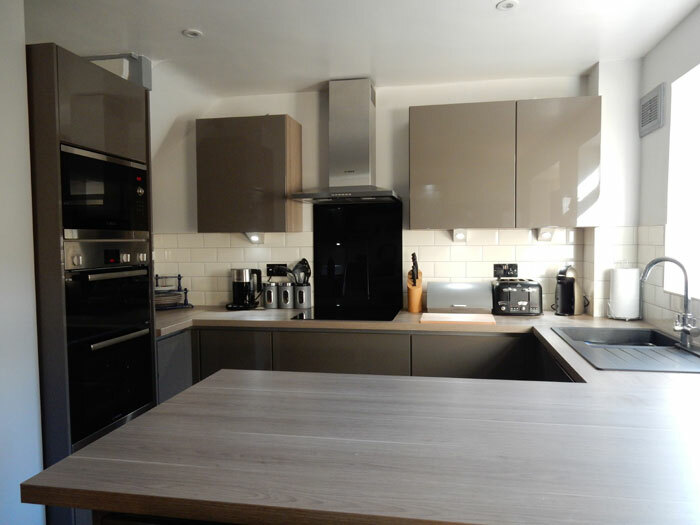 This is now a completely redecorated modern kitchen including appliances with a new flat floor creating the perfect hub to their home. 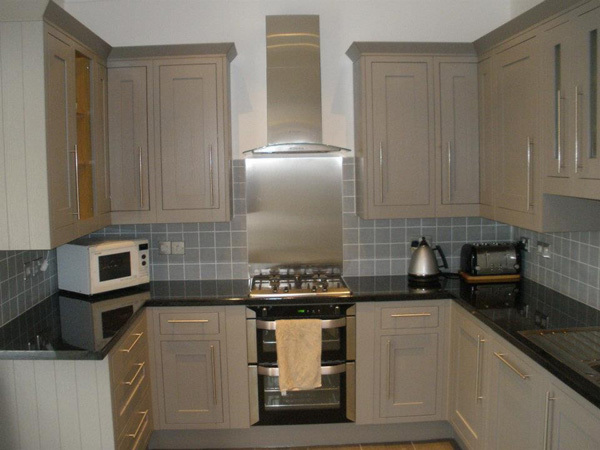 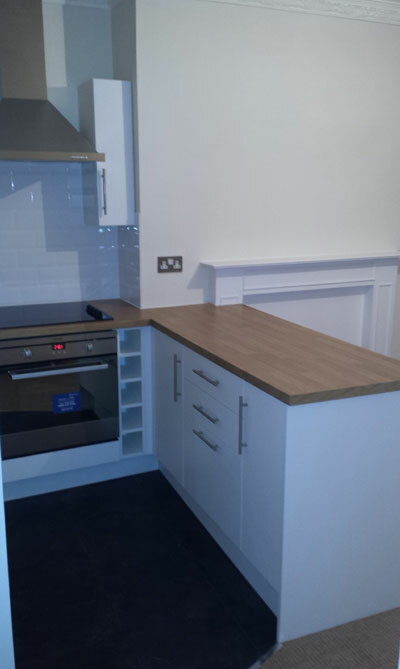 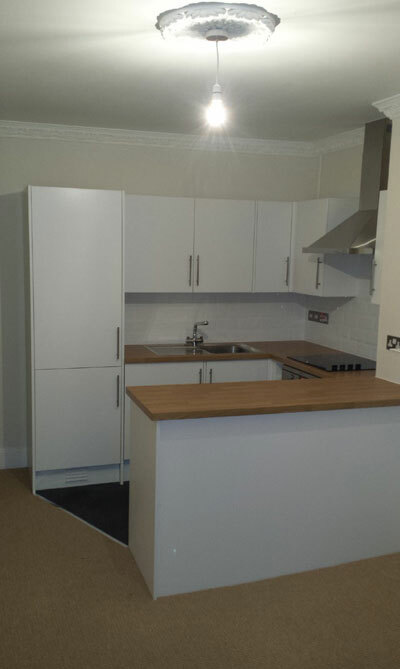 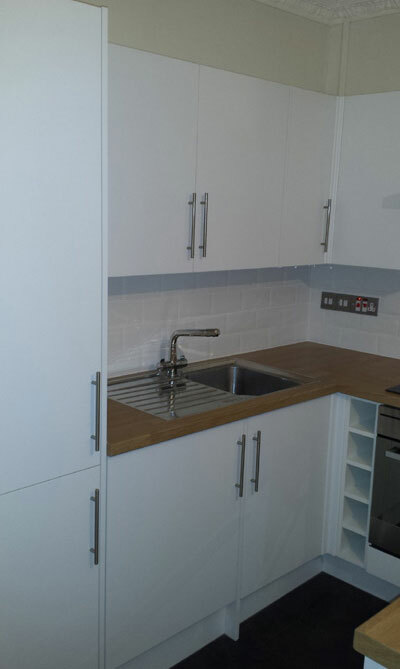 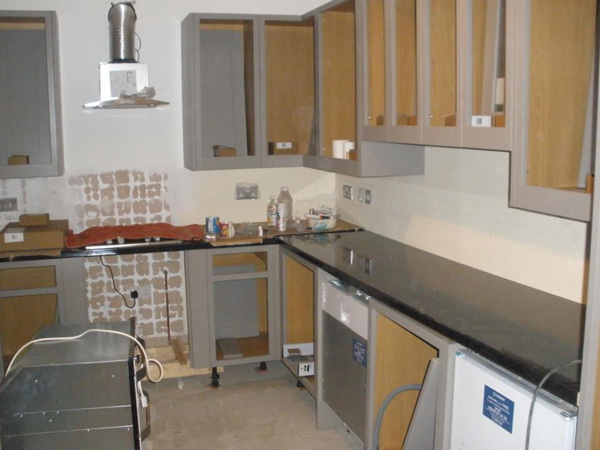 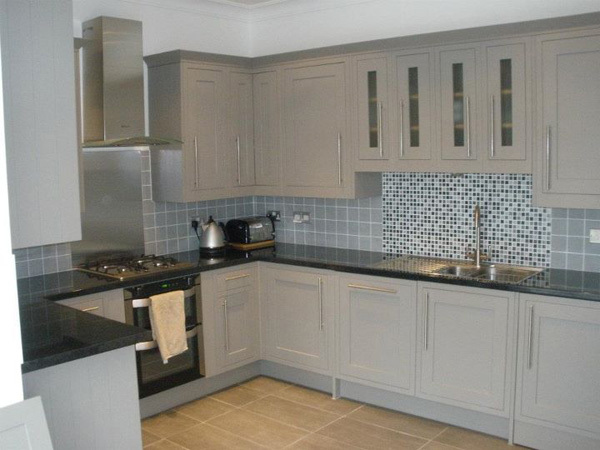 This kitchen was part of a complete refurbishment of a large studio flat. 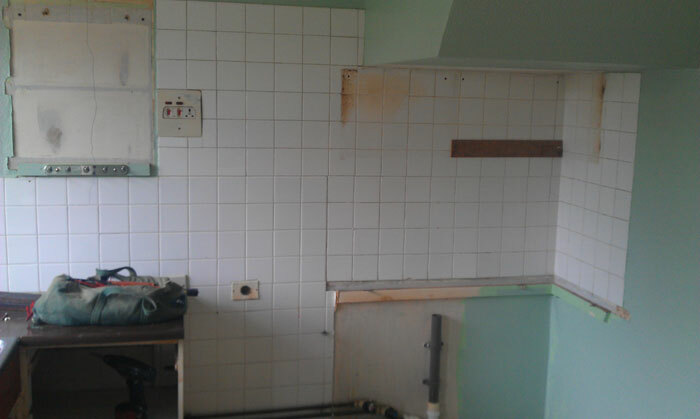 The original kitchen was in a shocking state and falling apart. 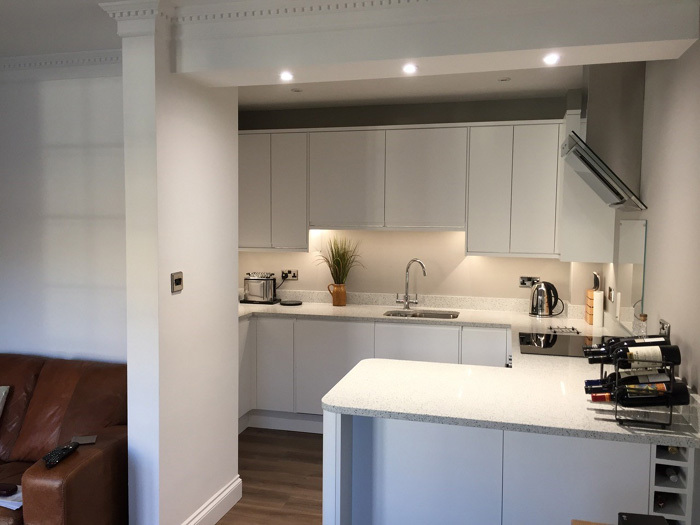 We stripped out the kitchen and converted it into a bedroom, relocating the new kitchen into the large lounge with all new built in appliances and a Karndean floor creating a very nice 1 bed flat. 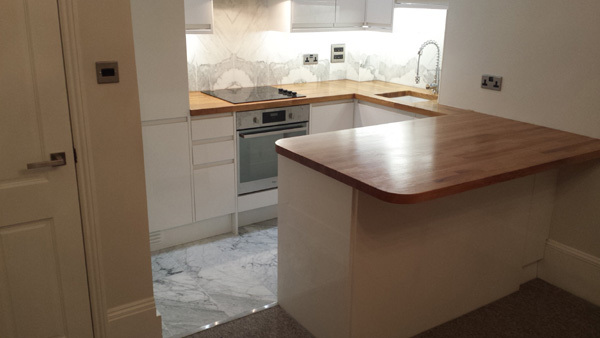 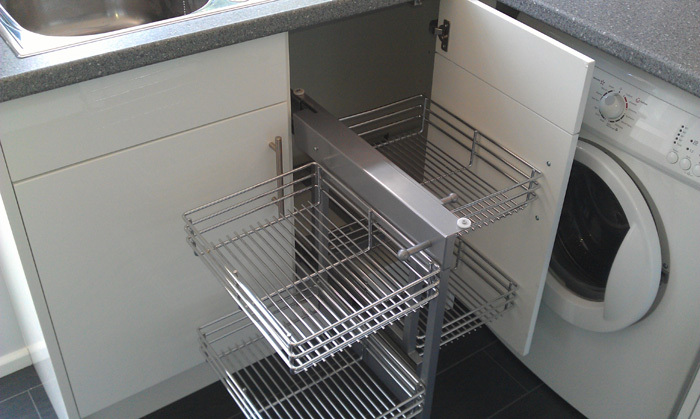 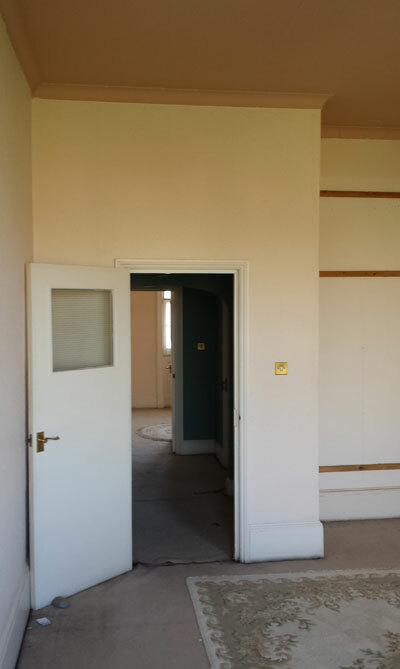 This was part of another complete refurbishment of a large 1 bed listed flat in Brighton. 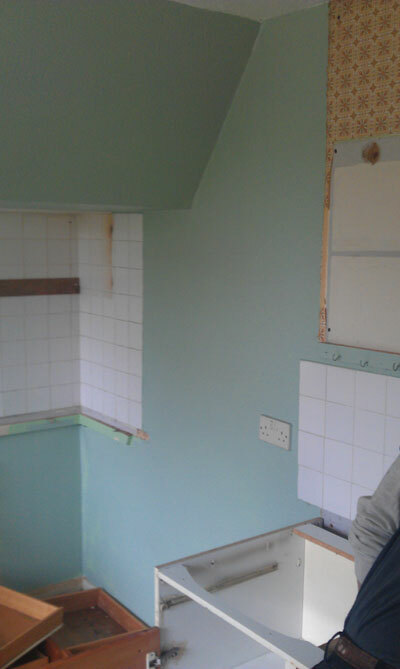 The old kitchen was stripped and converted into a bedroom. 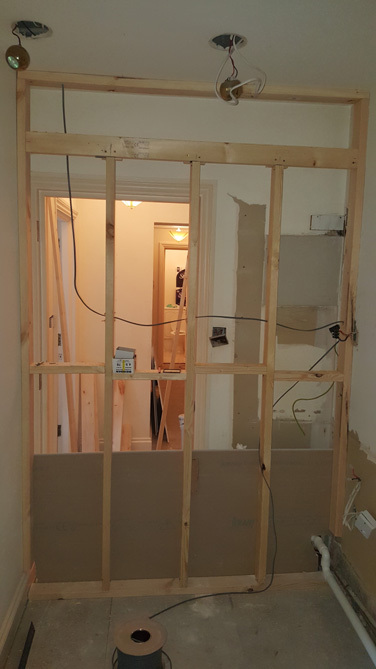 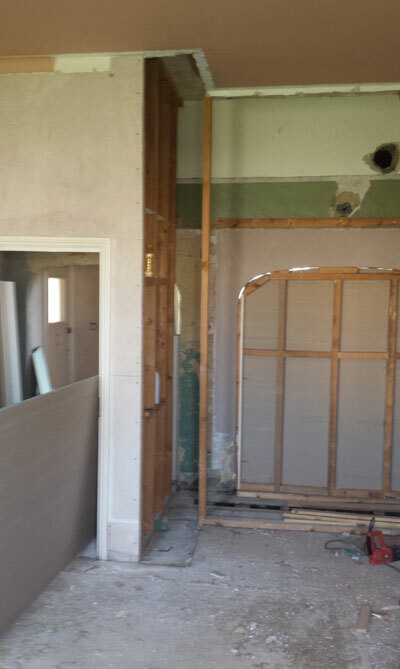 The bathroom was then pushed back 700mm extending the length of the lounge. 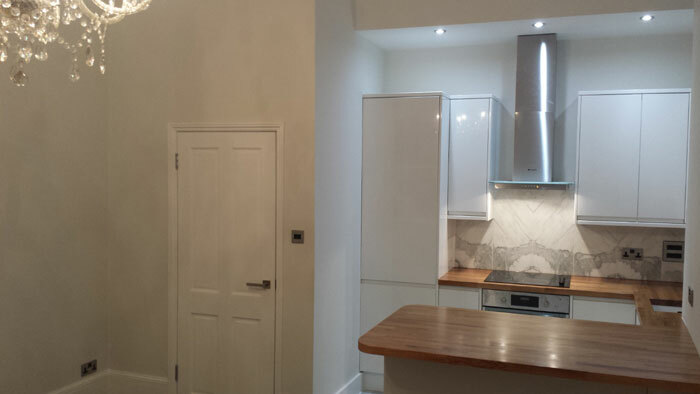 The new kitchen with fully fitted appliances, under mount sink, solid oak worktops, marble wall and floor tiles finished with under cabinet LED strip lights make this a truly elegant feature of the flat. 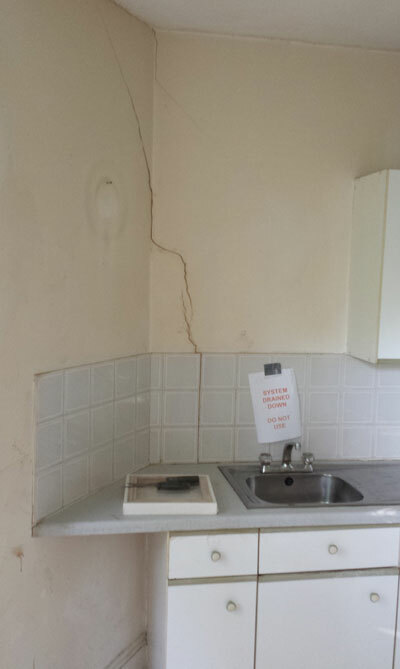 Robin had an extension added with a walk through into the kitchen. 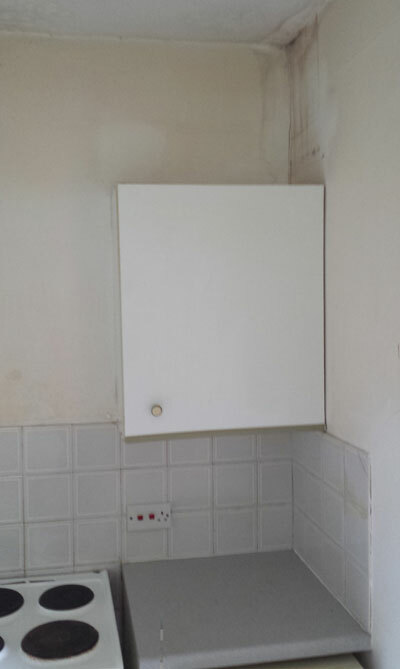 The kitchen needed to be completely turned around with all the plumbing moved and a new gas supply. 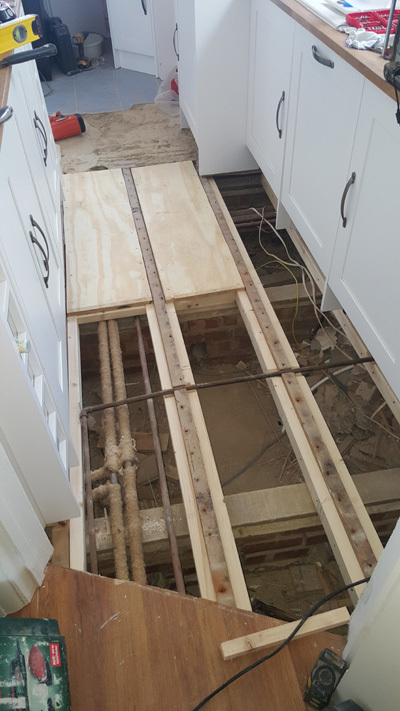 The floor needed levelling with deep latex then tiling. 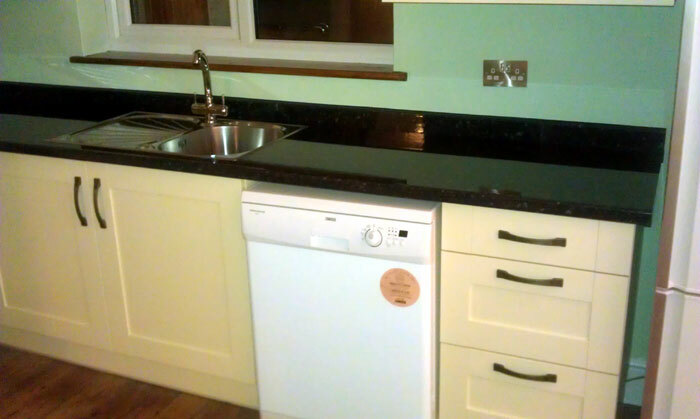 New kitchen fitted with all new built in appliances. 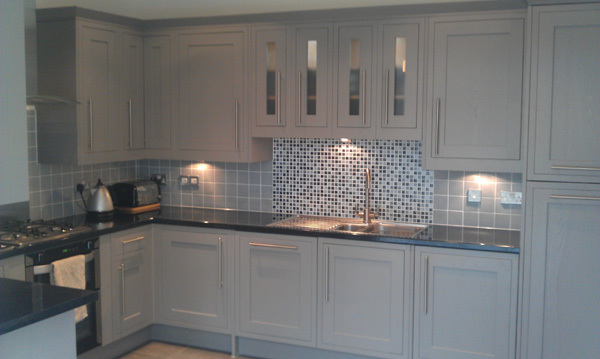 Feature tiled splash back behind the sink with under cabinet lights bringing a little extra to this stunning kitchen. 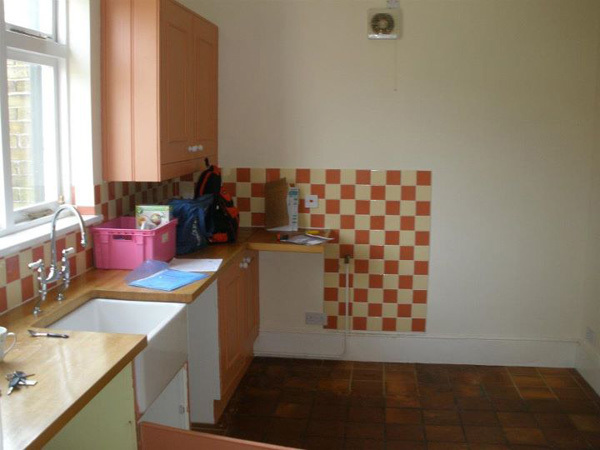 This kitchen was owner-chosen. 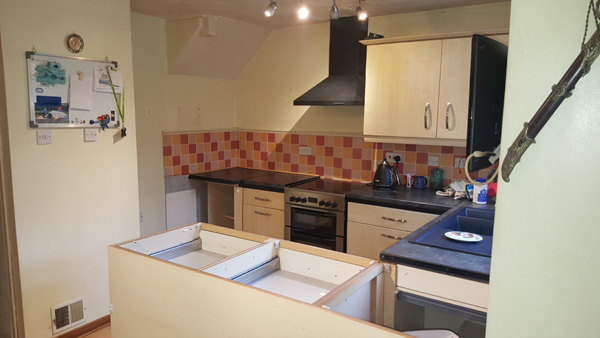 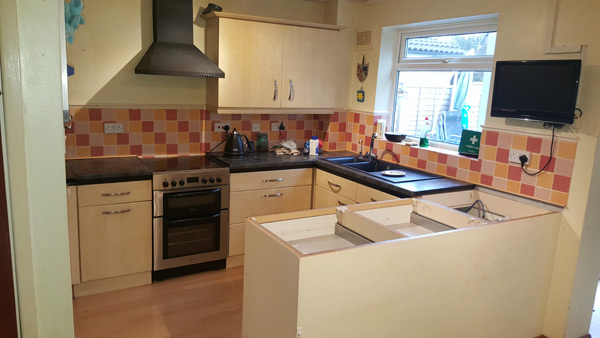 We stripped out and refurbished with an Odina handle-less kitchen with fully integrated appliances (double oven, microwave and an induction hob.) 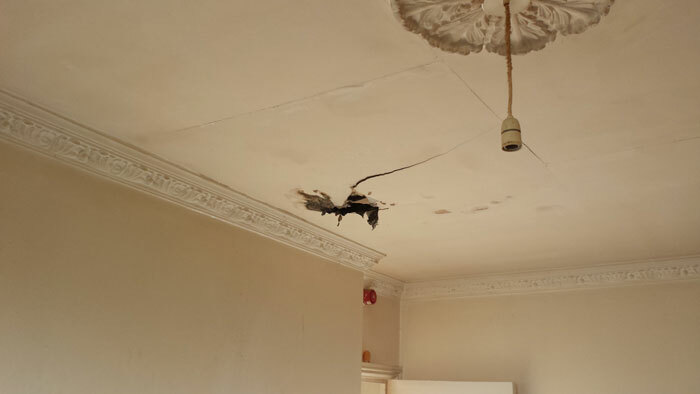 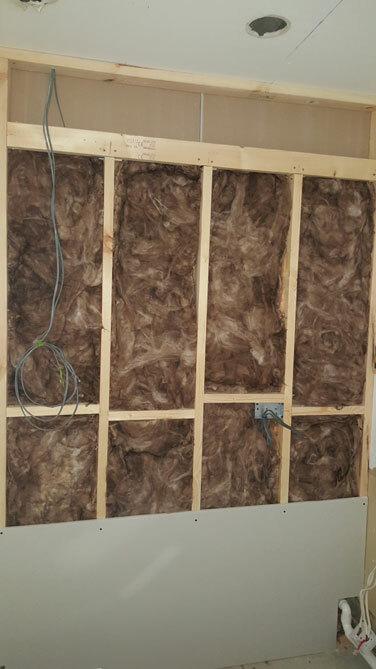 When we started the customer requested that we skim smooth the Artex ceiling ready for them to decorate. 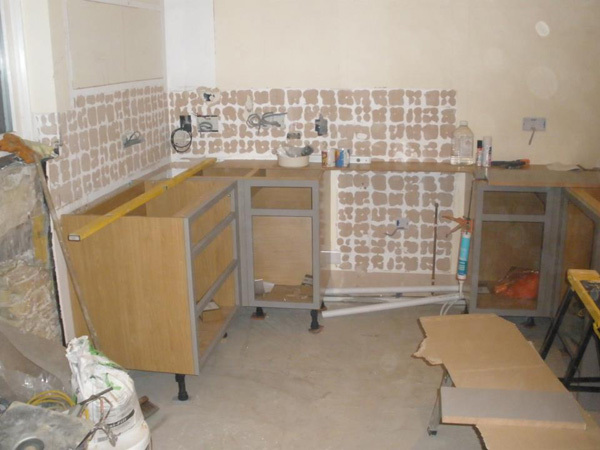 We were brought in at the end of their renovations to assist with their tiling needs. 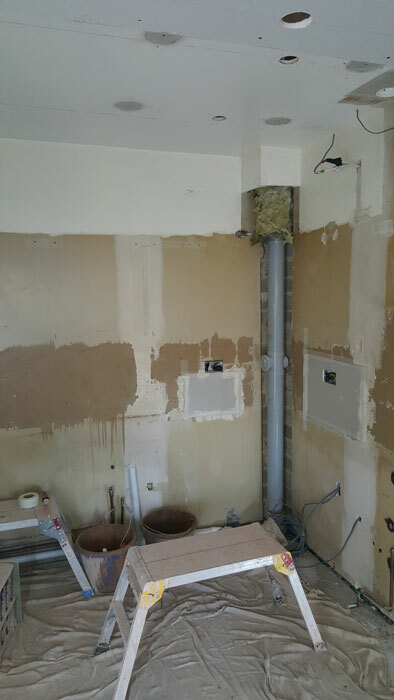 This was a complex tiling job due to two uneven levels in the same room going from timber to concrete. 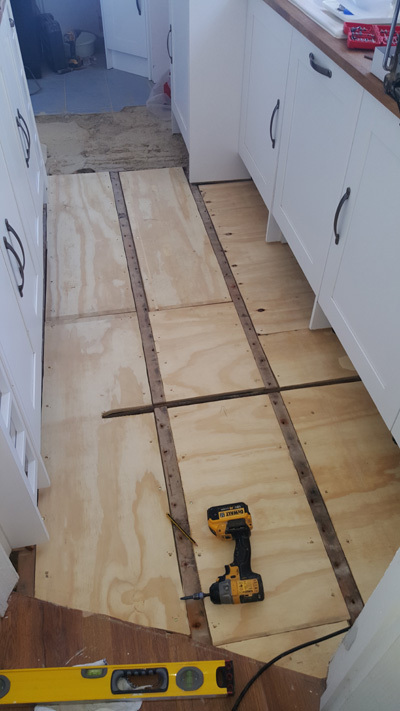 The timber floors were uplifted then lowered to accommodate hardibacker and levelled. 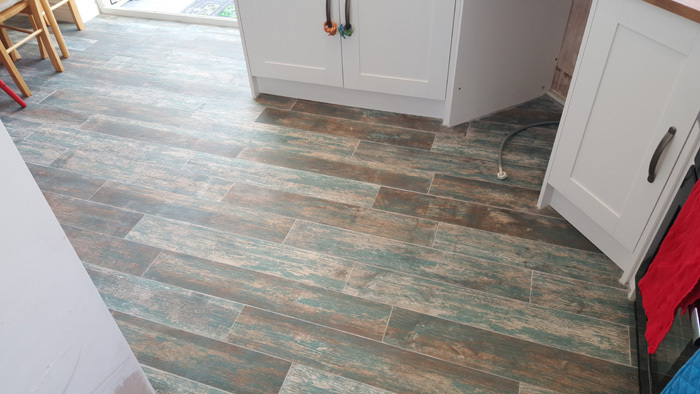 We laid a stunning 'aged-timber effect' porcelain tile which are the perfect completion to their kitchen renovation. 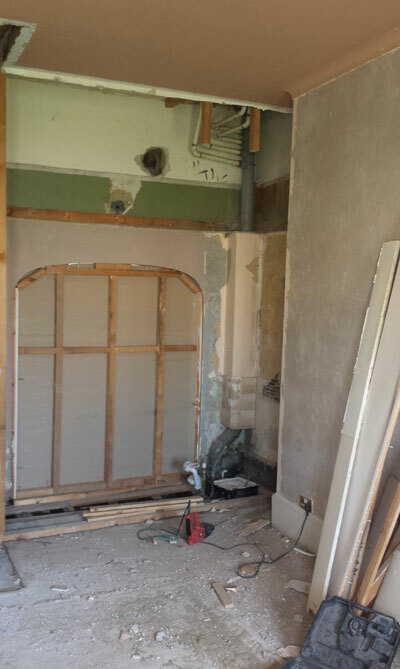 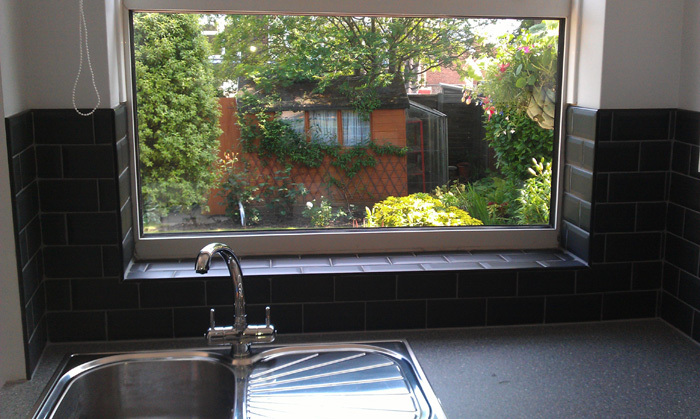 Following a very successful bathroom renovation they asked us to tackle their kitchen. 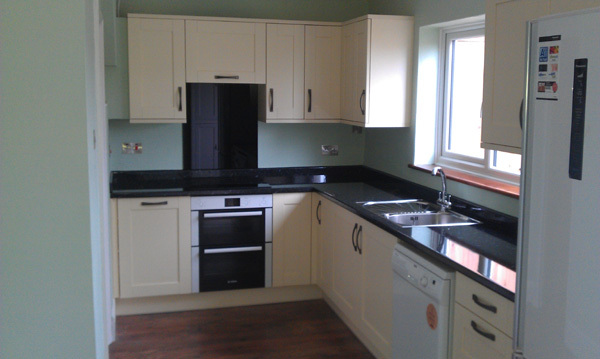 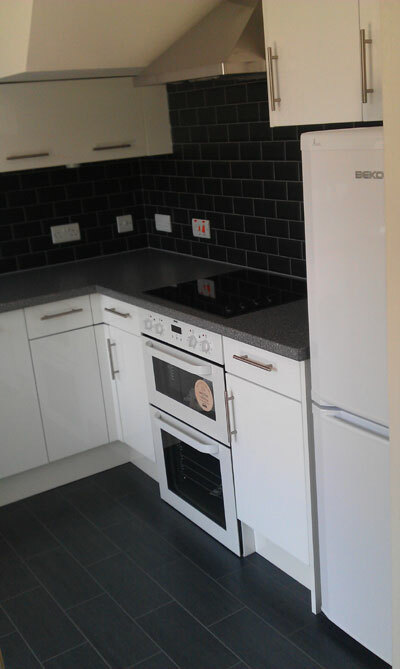 We stripped out the old, dated kitchen and installed a modern, black and white feature kitchen. 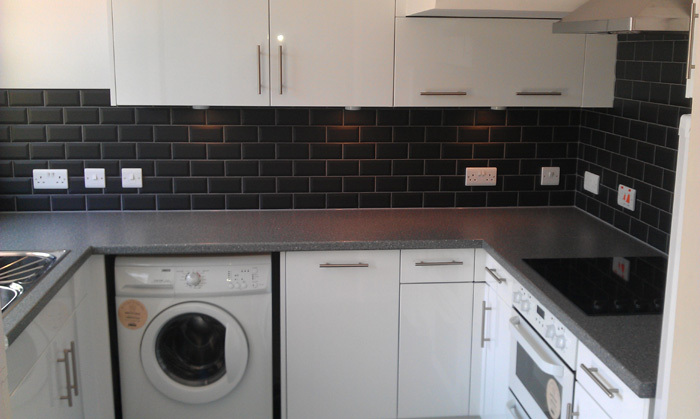 The splash back around the kitchen was tiled using mini Metro Black Matt tiles with white grout.